Available September 29, 2017. FIFA 18 is fueled by Cristiano Ronaldo, all-time top scorer of Real Madrid C.F. and winner of the Best FIFA Men’s Player Award. We can’t wait to show you more of this beginning with the full FIFA 18 reveal at EA Play live from Hollywood on 10th June, but Ronaldo looking even more Ronaldo-like than ever before is just the tip of the iceberg. Switch version will not be using the Frostbite engine and will be missing a few modes. There is no longer an Xbox Exclusive for Legends. 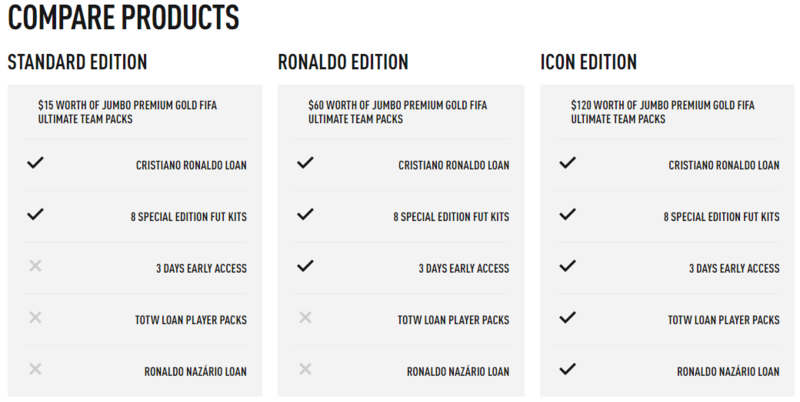 Legends are now called icons and can be played on XB1, PS4 and PC.